The outdoor pool free Wi-Fi and I-12 nearby make a big splash at Americas Best Value Inn. All 93 smoking and non-smoking rooms at this two-story Americas Best Value Inn feature cable TV with premium movie channels and free Wi-Fi. The hotel serves a free continental breakfast each morning. Strike up the grill in the barbecue area while the family splashes in the seasonal outdoor pool and the travel clothes spin in the guest laundry. Front desk service is available 24/7. Pets are allowed and parking is free. 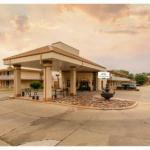 Located off I-12 and I-55 the Americas Best Value Inn offers a Hammond location three miles south of the Amtrak station and less than 60 miles north of New Orleans. Baton Rouge is 43 miles west. A three-mile drive leads proud parents to Southeastern Louisiana University. The hotel is also 46 miles north of Louis Armstrong New Orleans International Airport.